Look good, get found by potential customers & deliver results! We have built hundreds of websites for small business customers, not-for-profit organisations and schools. Depending on your requirements we can produce a site using an off-the-shelf content management system like WordPress, or for larger, more complicated requirements, build you something from scratch. We have very flexible options which allow our clients to take as much of a role as they wish in the development of the site – often we will develop the shell of the site and provide training so our clients can input their own data. On other occasions we’ll provide a turn-key site ready to go, and provide ongoing support on a monthly basis to make the client’s job as easy as possible. 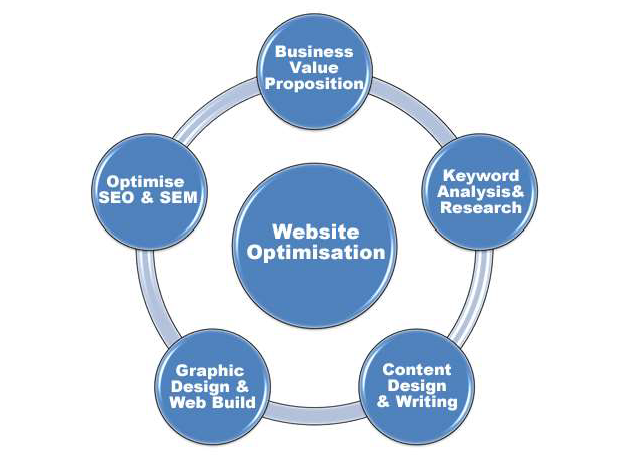 We partner with Website Optimisers for our Search Engine Optimisation work. We have found them to be very methodical and scientific in their approach to gaining our clients better rankings on Google. They will put together a plan for continuous improvement for your site’s performance. Over 75 million websites around the world use WordPress. WordPress is a highly sophisticated yet easy to use website content management system which is ideal for everything from basic brochure style sites to more sophisticated e-commerce sites. The beauty of WordPress is the availability of a large number of Plugins which can extend the capabilities of the system, but without the high cost of developing the functionality yourself from scratch. WordPress sites also have a large number of themes available which are optimised for mobile and tablet sized screens which now equate for a large proportion of the devices viewing websites. We have developed and provide hosting on our New Zealand based servers for a large number of sites developed in WordPress. We also provide a service to other web developers who have tricky WordPress issues they need help with, so you can rely on us to have the knowledge and capability to ensure your WordPress site is working properly. With any Content Management System like WordPress is is important to keep your site up to date and secure. This will minimise the chance that hackers can gain access to your site. We offer website hosting and support plans which include regular maintenance including scheduled backups of your site, updates of the WordPress system as well as themes and plugins. We strongly recommend all customers engage our services in this area. Full design and build, content loading and ongoing updates – for the customer who doesn’t want to be doing their own updates and would rather just send us an email when they have something needing to be changed. Full design and build, content loading and provision of training – so you can do your own updates on an ongoing basis. You can still come back to us for any support as required. Full design and build, provision of training and client loads their own content – keeps the cost down and allows you to learn the WordPress system as you load the content into your site. We provide support as required. Work with your graphic designer – we work with your designer who will supply the required graphics. We build the site and ensure it works well with all devices. Content loading could be done by you or us. There isn’t any point building a brand new website if your potential customers can’t find it. We strongly recommend undertaking a professional SEO (Search Engine Optimisation) review prior to commencing work on a new website. We partner with Search Engine Optimisation experts Website Optimisers Ltd who we have found to take a very methodical and scientific approach to the process. They also explain everything in plain English and work with you to come up with ways to improve your Google rankings. By conducting a SEO review prior to building your new site we can see where there are gaps in your current site’s content and structure which can be addressed during the new site development. Looking to take your business online and sell to the world? We can build you a website that makes this possible. Site design including creation of graphics – either working with your existing graphic designer or using our in house designer or one several designers we work with. Content loading – creation of pages to match the site map designed above, creation of content to accurately reflect the Search Engine terms required to draw traffic to your site. Adding plugins to allow customers to sign up to your newsletter, get discounts on their birthday, get an initial signup discount, counter shopping cart abandonment, allowing wholesale customers to log in and receive special pricing, securing your site against hacking attempts and many more possibilities depending on your requirements. Set up of site redirections so that incoming links to pages on your old site are properly redirected to the new equivalent pages on your new website. Installation of SSL certificate and setup of site on hosting environment so customers can be assured of safely giving their information to your site. Training so you or your staff can process orders and add/edit products on the website. Ongoing support and assistance with day to day queries. If you would like to know more or have an obligation free meeting to discus your requirements, please contact us. Vivid offers a number of different packages to assist any size business or organisation host their website. These can include registration of .nz or international domain names, provision of DNS hosting, email hosting, email redirections, email virus and spam filtering, POP or IMAP mailboxes, MySQL or MS-SQL database hosting, website hosting for HTML, SHTML, PHP and ASP.NET based websites. Coupled with these hosting plans we can also offer supporting including patch and update management for your WordPress or other CMS based sites. This helps prevent known exploits in website content management systems allowing hackers to gain access to your website. If you’d like to know more about these services or get a free consultation on how we can help, please contact us. Unlike other providers we can customise a package to fit your specific requirements. If you’re looking for a solution to host your email with large capacity and to share calendars and contacts within your organisation then please see our page about Office 365. This could include any number of email POP accounts, IMAP mailboxes, forwarding domain email to your existing email addresses and multiple aliases, email scan and forward to an internal mail server, catchall accounts and more. If you have specific requirements or need more users than listed in the above plans, please contact us for a customised quote. Vivid Computers Ltd is a Microsoft Partner and can help you sign up for Office 365 or Hosted Exchange and provide ongoing support for the operation of the system. We have migrated a large number of organisations from their existing email hosting arrangements (for example in house Exchange Servers, other providers’ Exchange Servers and conventional POP/IMAP hosting providers) and have the experience to handle your migration as seamlessly as possible. Microsoft’s Office 365 refers to subscription plans that include access to Office applications plus other productivity services that are enabled over the Internet (cloud services). Office 365 includes plans for use at home and for business. Learn about Office 365 for use at home. Office 365 plans for business include services such as Skype for Business web conferencing and Exchange Online hosted email for business, and additional online storage with OneDrive for Business. And you can install them across multiple devices, including PCs, Macs, Android tablets, Android phones, iPad, and iPhone. Ideal for companies wanting a more sophisticated email hosting platform. Shared Calendar and Contacts – compare calendars with other people in your organisation to schedule meetings and access collaboration features, including shared calendars, groups, the global address list, external contacts, tasks, conference rooms and delegation capabilities. In-Place Archive – keep your inbox clean by automatically moving old messages to an in-place archive. We partner with leading Search Engine Optimisation provider Website Optimisers for all our SEO Work. We use a collaborative approach which has worked very well for our clients delivering measurable results. The SEO industry does have a lot of cowboy operators who will over promise and often under-deliver whilst sending you large bills. Sometimes they’ll allow their junior staff to experiment with your site (and at your expense). Rest assured that this will not happen when working with us and Website Optimisers. Website Optimisers is also a Google Partner meaning they are authorised by Google as an Adwords Specialist. Website Optimisation is and end to end process and part of a larger Digital Marketing strategy rather than something you apply at the end of a website build project. SEO is also broken up into two areas, one relating to the Technical SEO aspects such as Meta Tags, broken links, page not found (404) errors and website health. The second area is called Content SEO and involves the design of the content for the website based upon keyword and competitor analysis work and ongoing optimisation. If you are interested in getting help with Search Engine Optimisation or Search Engine Marketing please contact us.